Mark Burford is a co-owner of Tallus Capital Management which he founded with partner Jeff Pisan in 2012. Prior to starting his independent wealth management company he spent several years with Edward Jones and Merrill Lynch. Mark received his Bachelor degree from Lewis & Clark College in Portland Oregon in 1979. He received the Accredited Asset Management designation from The College of Financial Planning in Denver Colorado in February of 2007. Mark was born Missouri and moved to the Pacific Northwest when he was 10 years old. He has been married to his bride, Robin, for over 37 years and has three children. Caitlyn is a college professor at Northern Arizona University, Ross is a graduate of University of Oregon and works for Ventana Research in Bend Oregon and Cole who is pursuing a career in the medical profession. 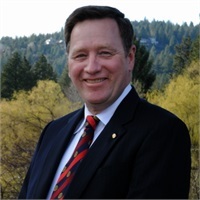 Mark is an active member and past president of the Sunriver Rotary Club, a member of Westside Church in Bend, and a supporter of classical music through the Sunriver Music Festival. His favorite hobby is fly fishing on the lake and streams of Central Oregon.